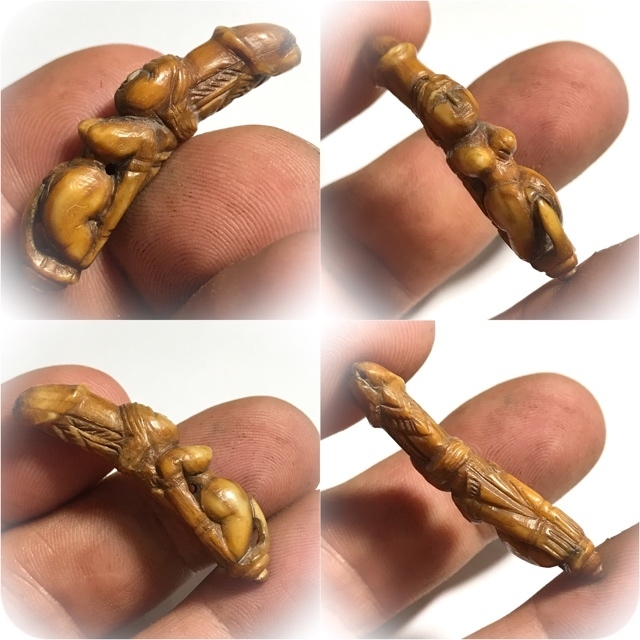 A Very Special and Rare 'Niyom' preferred exhibit of the world famous Palad Khik Mae Nang Kruan Phallic Lingam amulet with Nang Prai Deva entwined around the Phallic in carved ivory - a Classic and visibly Preferred Class Niyom Category amulet, with exquisitely fine carvings from a preferred artisan, from the great Luang Por Kong, of Wat Wang Sapparot (2445 - 2532 BE). 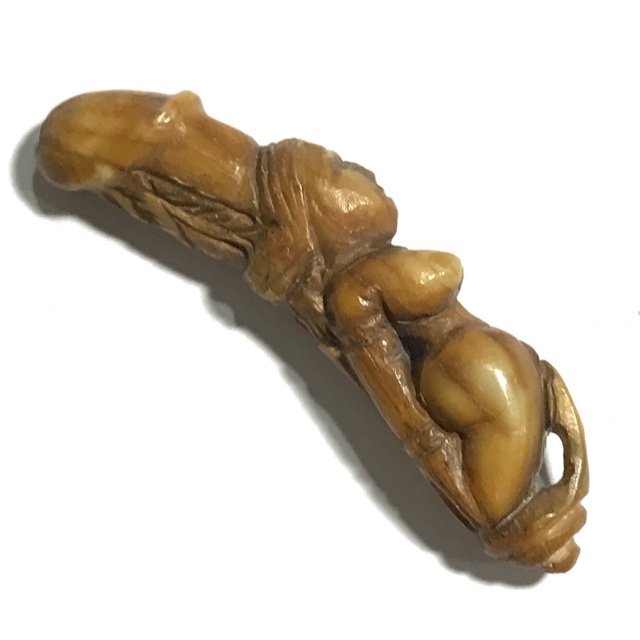 Exhibits with this level of artistic mastery are always given a higher status and are the most preferred of all the Palad Khik of Luang Por Kong (for obvious reasons). 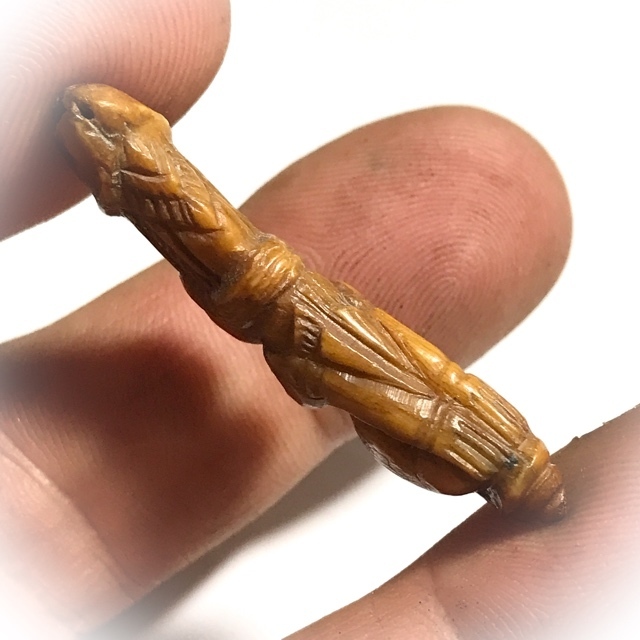 Made from ,hand carved ivory considered a very powerful magical substance. 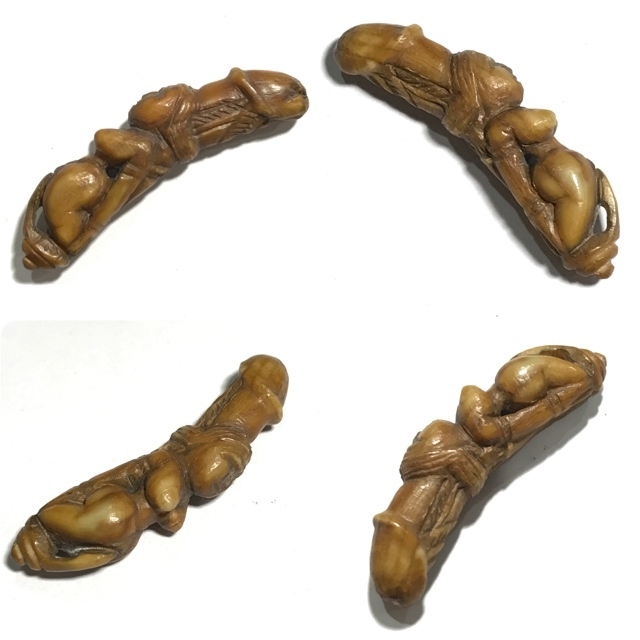 Luang Por Kong was most famous for Palad Khik, especially the Palad Khik Mae Nang Kruan above all others, and also other carved ivory ands wooden Animist Charms of this variety. 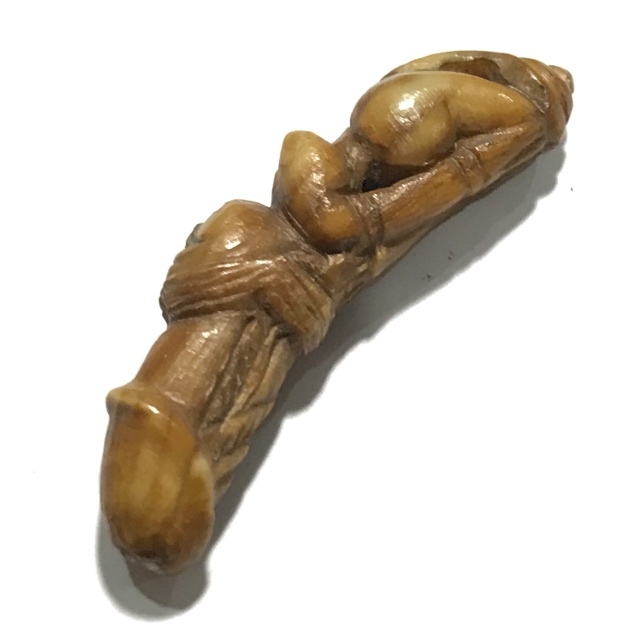 This can be considered a rare opportunity to obtain such an inimitable occult charm in sacred ivory from this Great master of Yesteryear. 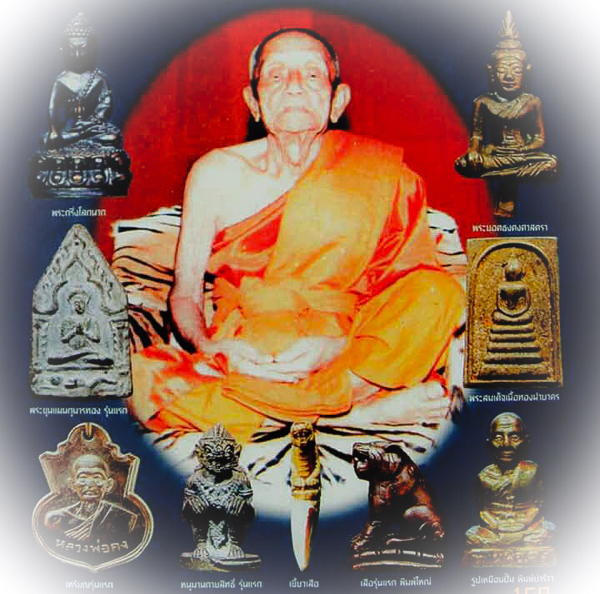 Luang Por Kong began to become both Nationally and Internationally famous during the 2nd World War, as he began to make Yant Shirts and Yantra Flags, and his now famous Palad Khik amulets, and issue them continuously as he made them. 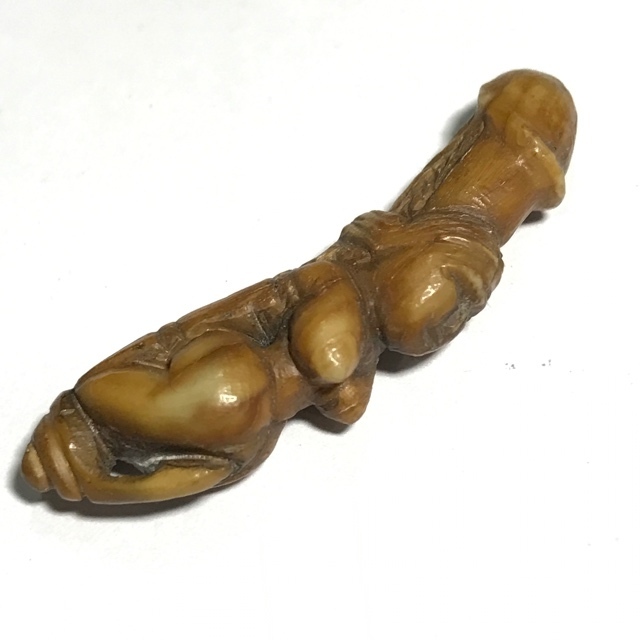 The Palad Khik is carved in the classic Phallic shape as a Shiva Lingam from ivory, and is fashioned with a Nang Prai Mae Kruan Nang Deva entwined around the Phallic empowering the Palad Khik with Maha Lap, Maha Sanaeh, Metta Mahaniyom and Kong Grapan Power. 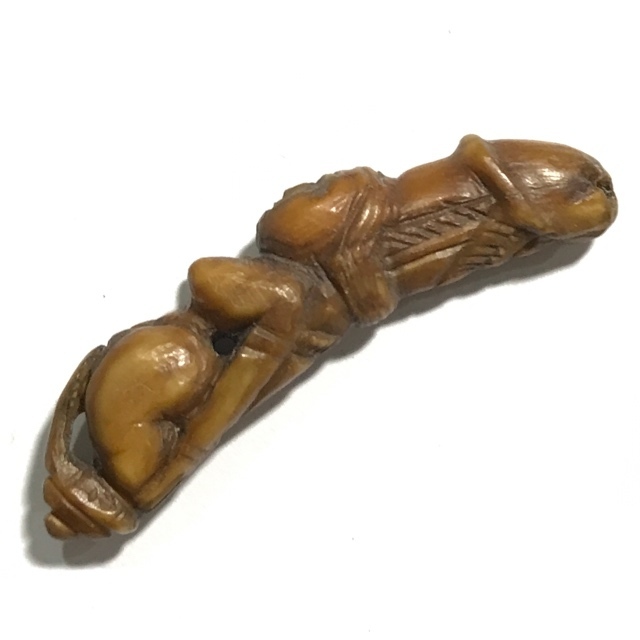 This particular carving is extremely attractive visually, for the flawless surface of the ivory carvings, and the contours and clarity of the detailed carving of the Mae Nang Kruan. 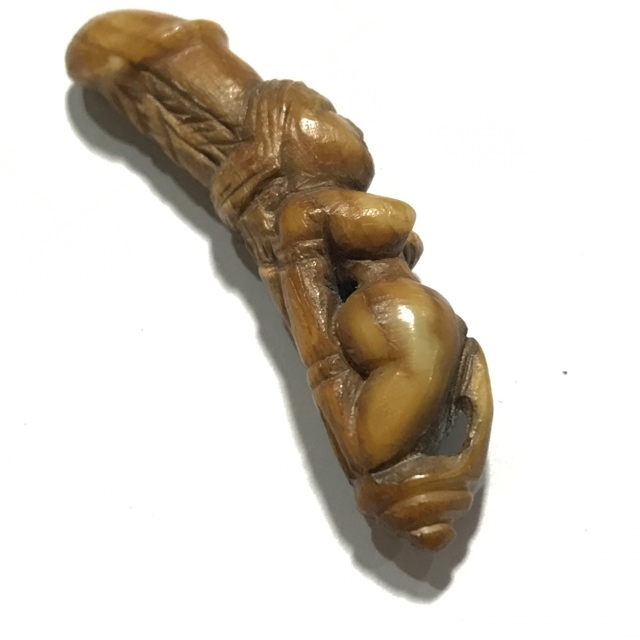 The carving is immediately recognisable as coming from the devotee artisans of Luang Por Kong, and carries his distinct personal look and style, making this an Ongk Kroo model for its ease of recognition. 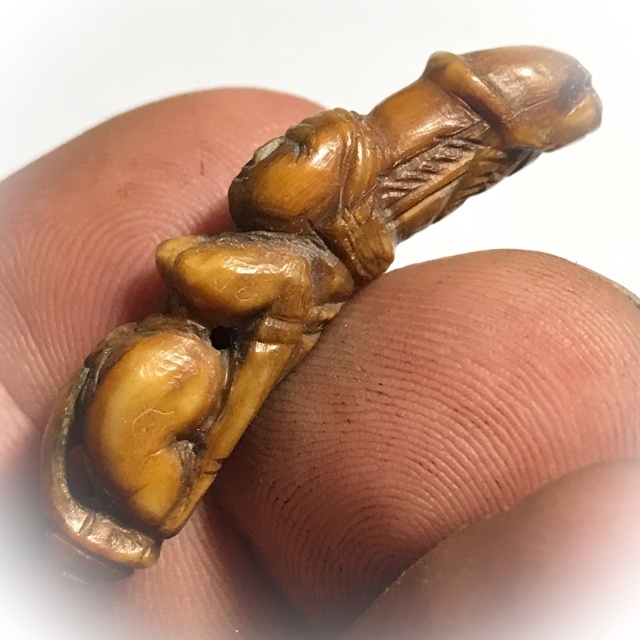 The Palad Khik has a pendant hole carved into it, for which reason, it is not really necessary to encase it in a waterproof pendant casing, but of course can be if preferred. 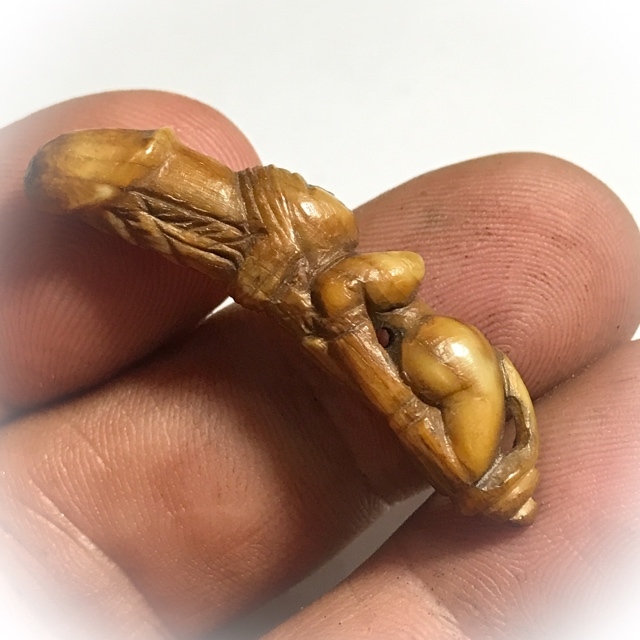 Most people prefer to tie it to a waist cord and wear it around the waist, and let the Sacred Wood come into contact with the skin, for a strong magical connection to its aura of power. 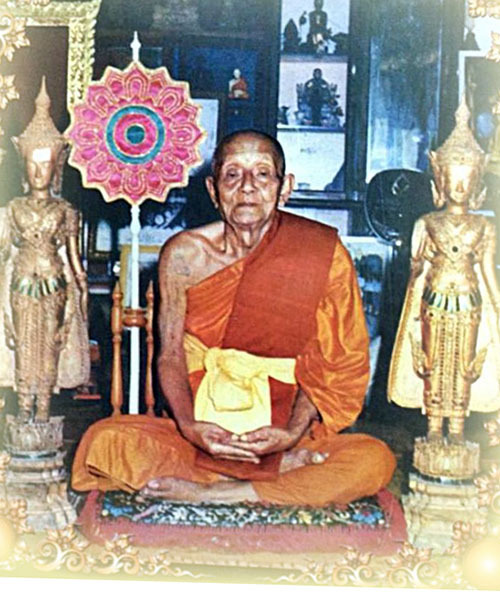 Luang Por Kong of Wat Wang Sapparot was one of the Great Guru Masters of Yesteryear, and is an Internationally and Officially documented Master, whose amulets have graced the pages and covers of Top Thai Buddhist Amulet magazines for decades. 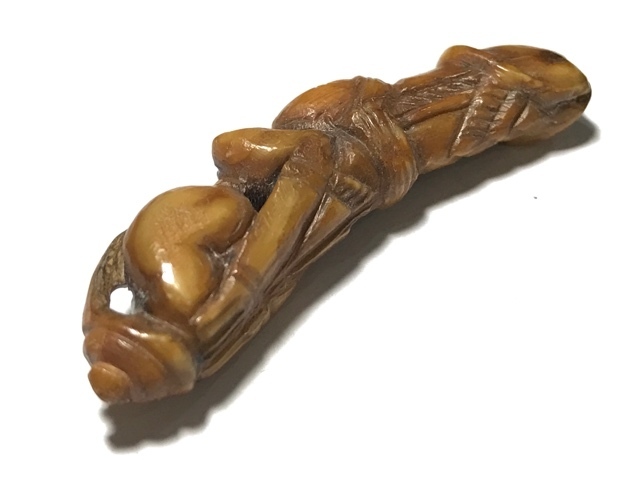 Many high ranking members of the police force, and military forceas well as members of the Royal Court have been said to have worn his amulets and experienced their miraculous powers, and indeed there are many officially recorded tales of such events. 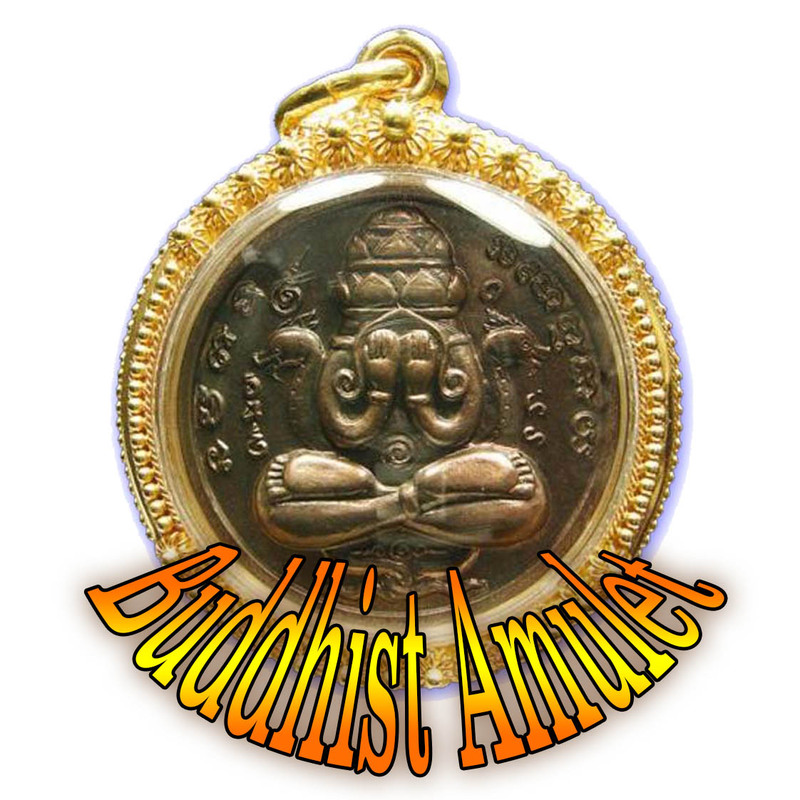 His amulets are famed for his immense power of Maha Lap, Kaa Khaay, Metta Maha Saneh and Klaew Klaad Kong Grapan Chadtri Power. 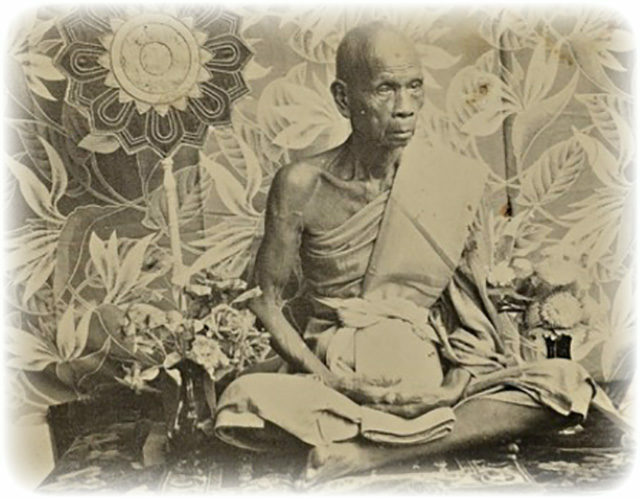 His Patipata (Purity and Diligence of Practice as a Buddhist Monk) were Legendary. 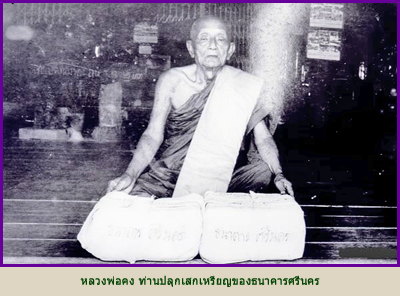 His great generosity was unequalled and he would never refuse anybody his help. He was famed for always taking in and helping people who were ill and suffered sicknesses, and to offer them his full assistance. 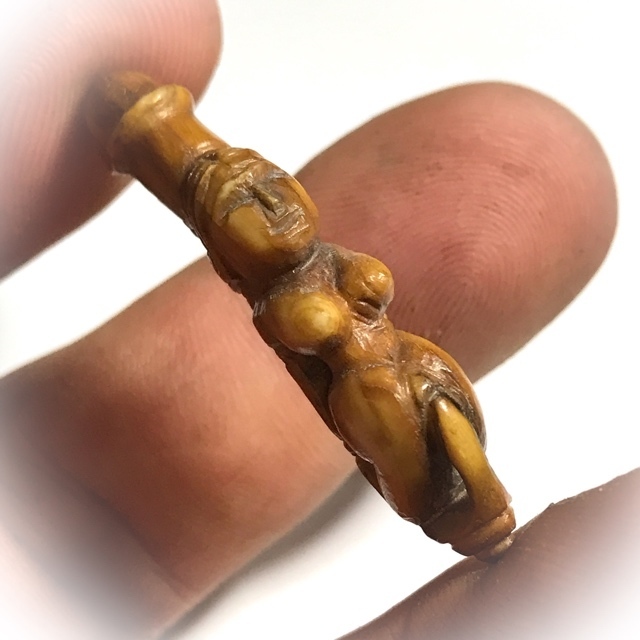 The carving is fashioned in the ancient animist style of imagery, and has the inimitable features which are so easily recognisable as the work of Luang Por Kong. 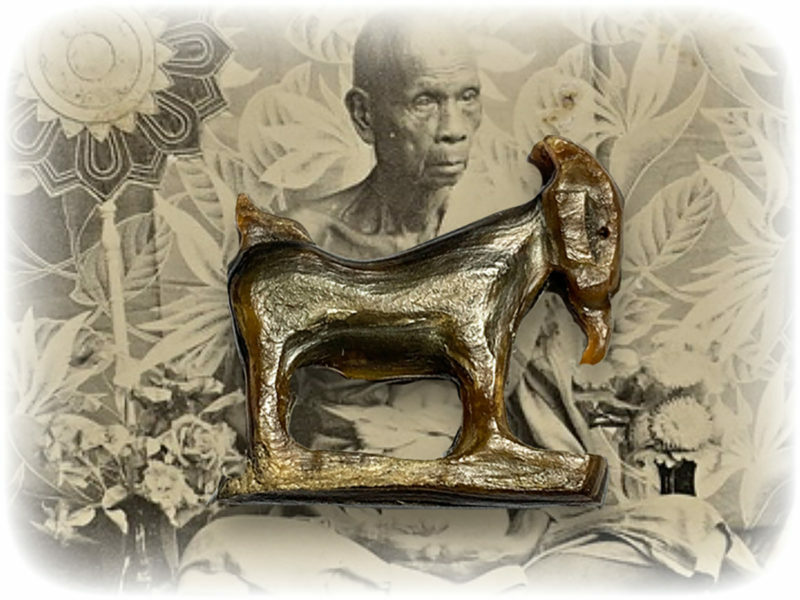 The Palad Khik Mae Nang Kruan is perhaps one of Luang Por Kong's most famous amulets. 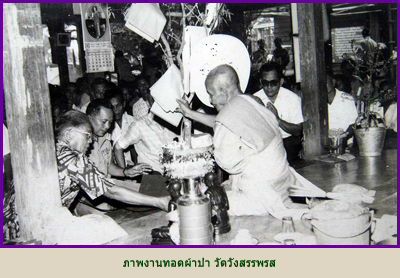 The Palad Khik Mae Nang Kruan is extremely well known and popular for its great Kaa Khaay (good business sales) Power, as well s for having very strong Maha Sanaeh Seductive Influence and immense 'Siang Choke' (Gambling Luck) Power. 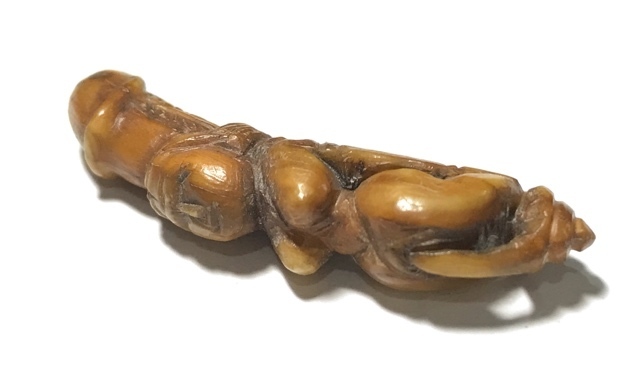 But indeed, what is less known is that the Palad Khik is also a very powerful amulet for Klaew Klaad evasion of dangers and also for Kong Grapan invincibility magic. 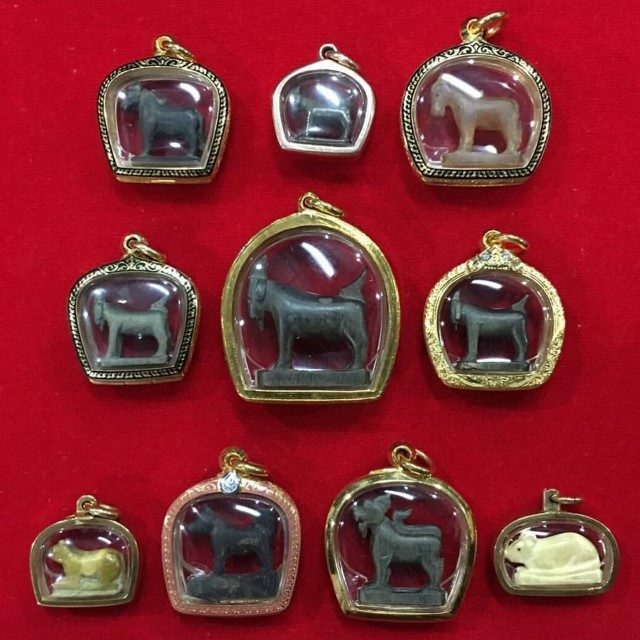 Luang Por Kong of Wat Wang Sapparot is an Internationally and Officially documented Master, whose amulets have graced the pages and covers of Top Thai Buddhist Amulet magazines for decades.